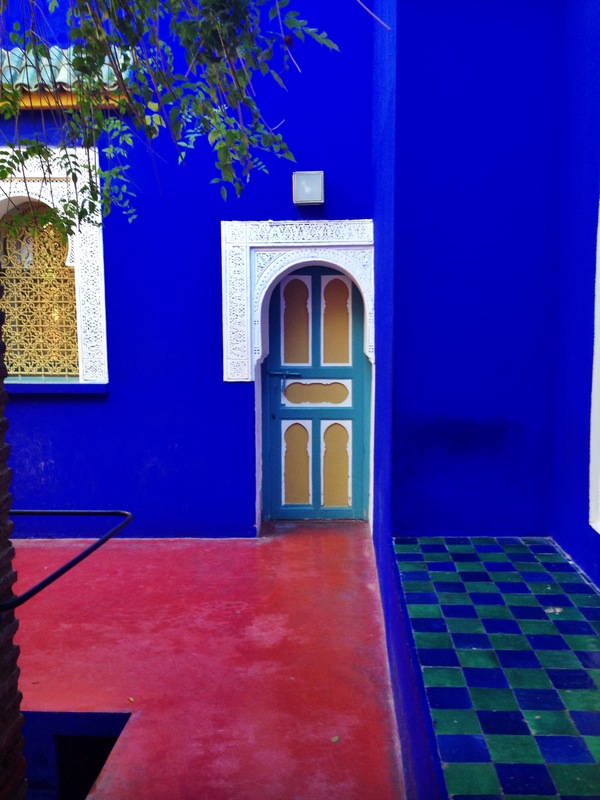 Picture of Jardin Majorelle taken by me in January 2015. The NYX Vivid Brights Eyeliner in Sapphire is a classic dip-style liquid liner with a little brush tip. I’ve been a devotee of a pen-style liner for over three years, but this brush has an incredibly fine tip that makes it easy for even those of us who have been wearing eyeliner since age seventeen but still can’t do it in our sleep to create a thin, fine line. NYX Vivid Brights Eyeliner in Sapphire brush tip. To complement the NYX Vivid Brights Eyeliner in Sapphire, I pulled in my YSL Volume Effet Faux Cils Mascara in Bleu Majorelle and my trusty Annabelle Kohl Eyeliner in Lapis which I’ve had since the beginning of time. I put “full face” in quotes because all I’m actually wearing besides my eye makeup (which also included a tiny bit of a medium-brown eyeshadow in the crease) is NARS Radiant Creamy Concealer in Chantilly under the eyes, Maybelline Colour Tattoo in Tough as Taupe through the brows, and MAC matte lipstick in Please Me. As with my NARS Audacious Lipsticks (which I photographed on the same day, clearly), this entire look would be a bit more pulled together with some blush at the very least. I’m really happy with the colour of the NYX Vivid Brights Eyeliner in Sapphire. It’s a true vibrant sapphire; sometimes I find shades labelled “sapphire” or “cobalt” are a bit dark (as was the case with the YSL nail polish in Bleu Majorelle), but this one is light and electric enough that it satisfies me. So, no disappointments with the colour at all. The formula is also impressive to me. I have a long-documented issue with eyeliners of all sorts transferring on my hooded eyelids, which is why I’ve been so loyal to my Stila Stay All Day liner for years. Regardless of the beautiful colour, this liner would be useless to me if it didn’t stay put. Luckily, I found that the NYX liner dried down quickly and to a pleasing matte finish and didn’t transfer whatsoever. By the end of about a ten-hour wear period, my wings had flaked off a bit, but I’m not sure if that’s because I had rubbed my eyes somewhere in there. All the liner along my lashline was completely intact. NYX has a few other colours in the Vivid Brights line which look really nice, so even if Sapphire in particular doesn’t appeal to you I’d certainly recommend the line if you’re looking to try out a fun colour in a solid formula on the cheap. NYX Vivid Brights Eyeliner in Sapphire swatch. NYX Vivid Brights Eyeliner in Sapphire retails for $10.99 CAD (though it frequently goes on sale for less) for 0.06oz, or $183.17 CAD per oz. Canadians can pick it up at select Shoppers Drug Mart locations or at standalone NYX stores, of which there are two in Toronto. Eyeliner is not one of my notable skills but I don’t find this one hard to work with! Usually I do have difficulties with this type of brush, but this one is very small and not too liquidy. Ohhhh you really went for full-on blue! It looks great. I love this colour, it looks so stunning on you as well! It’s such a rich, deep and yet cheery hue. I wouldn’t have believed it to be Nyx either – although I have seen that they’ve got some pretty exciting colours! It is very rich and very cheery! And yeah, NYX does interesting colours in general. They’re one of the edgier drugstore brands.